The wear of occlusal surfaces of natural teeth is a process that takes place during the lifetime of a person. In vivo research data shows that natural enamel wears about 30 μm/year or about 0.3 mm in 10 years. Excessive occlusal wear can result in pulpal pathology, occlusal disharmony, impaired function and esthetic disfigurement. Therefore, it is important to identify the factors that contribute to excessive wear and evaluate alteration of the vertical dimension of occlusion (VDO) caused by the worn dentition. In many cases, the VDO is maintained by tooth eruption and alveolar bone growth. Therefore, alteration of the VDO should be conservative and should not be changed without careful consideration. , However, the rehabilitation of the severely worn dentition is challenging when the space for restoration is not sufficient. This clinical report describes the treatment of a patient who was clinically monitored to evaluate the adaptation to a removable occlusal splint during a 1 month trial period and provisional restorations for 3 months. A 45-year-old man reported for the treatment of his severely worn dentition and his chief complaint was that he could not eat anything because his teeth were worn too much, were hypersensitive and had an unesthetic appearance. Patient had no relevant medical history. Intraoral examination revealed a generalized loss of tooth structure that was greater in the maxillary anteriors and mandibular posteriors. Mandibular canines, left lateral incisor and first premolars were severely worn [Figure 1]a-c. Maxillary left first molar was grossly decayed. The anterior teeth had sharp enamel edges, dentinal craters and attritional wear due to the loss of posterior support. 26, 47, 42, 41 and 31 were missing [Figure 2]. The facial type of patient was square and his lip was hypertonic. 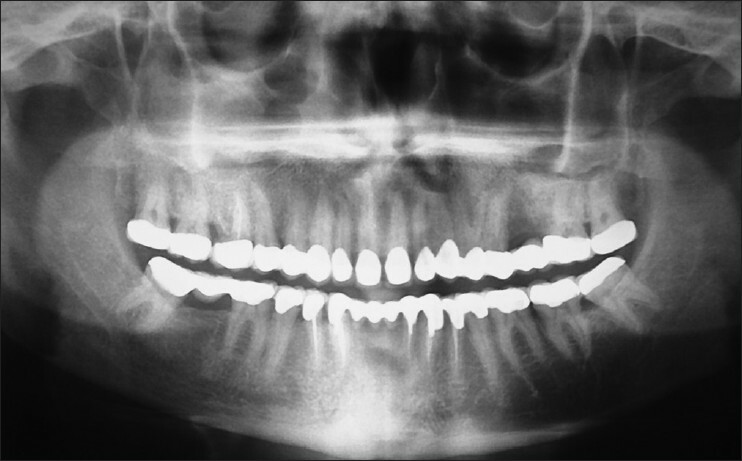 Patient did not have temporomandibular disorders, but a discrepancy between centric occlusion (CO) and maximum intercuspal position was found when she was guided to centric relation (CR) with bimanual technique. Phonetic evaluation: If the distance between the incisal edge of the mandibular incisors and lingual surface of the maxillary incisors is about 1 mm, the patient is able to pronounce "s" normally. The patient's increased space altered the "s" sound to "sh"
The possible causes of patient's worn dentition might include posterior interferences, parafunction, eating habit and dental ignorance. The options presented to the patient were removable partial dentures and full mouth rehabilitation with metal ceramic restoration with or without crown lengthening procedure and implant retained replacement of missing teeth. The patient was anxious about implant surgery, so this option was excluded. As there was clinical evidence of reduced VDO, full mouth rehabilitation with increasing VDO was planned. Patient's casts were mounted on a semi-adjustable articulator (Hanau™ Modular Articulator; Whip Mix Corp., Louisville, USA) using a face-bow record and an interocclusal record was made with the aid of a lucia jig and polyvinylsiloxane occlusal registration material (Exabite II; GC Corp., Tokyo, Japan). Vertical dimension at rest was found to be 68 mm by using facial measurements after swallowing and relaxing and was verified using phonetics. VDO was found to be 61 mm using Niswonger's and Thomson's technique. Freeway space was 7 mm. The existing VDO was increased by 4 mm using the incisal guidance pin of the articulator to a new VDO of 65 mm. The splint was designed to offer bilateral contacts of all posterior teeth in CR and guide the anterior teeth in excursive movements. The anterior guidance disoccluded the posterior teeth in all jaw positions except CR. The adaptation of the patient to the increased VDO was evaluated during a 1 month period using the orthodontic appliance. No muscle tenderness or temporomandibular discomfort was found. Increasing the VDO was mandatory to allow the condyles to assume their most SAM position in intimate contact with the thinnest part of biconcavity of disc. It permitted the entire temporomandibular joint (TMJ) complex to attain an improved functional health and allowed the posterior avoidance patterns of occlusion to wane and a new vertical dimension to be established. After recording the CR using lucia jig and wax-rim, diagnostic wax-up was performed. Autopolymerizing acrylic resin (Alike™; GC America, Alsip, USA) provisional crowns were fabricated using a vacuum formed matrix (Drufolen H; Dreve Dentamid GmbH, Unna, Germany) on a cast using indirect technique that was duplicated from the cast with the diagnostic wax-up. The simultaneous arch technique was employed for rehabilitation. All existing teeth were prepared to accept full veneer metal ceramic restorations with equigingival chamfer margins [Figure 3]a and b. The provisional fixed restorations were cemented with temporary cement (Freegenol Temporary Pack; GC Corp., Tokyo, Japan) and esthetics and emergence profile was evaluated. It was noticed that the crown height was insufficient and the patient had a gummy smile. It was decided that the gingiva needed recontouring. The maxillary and mandibular provisional were temporarily removed. 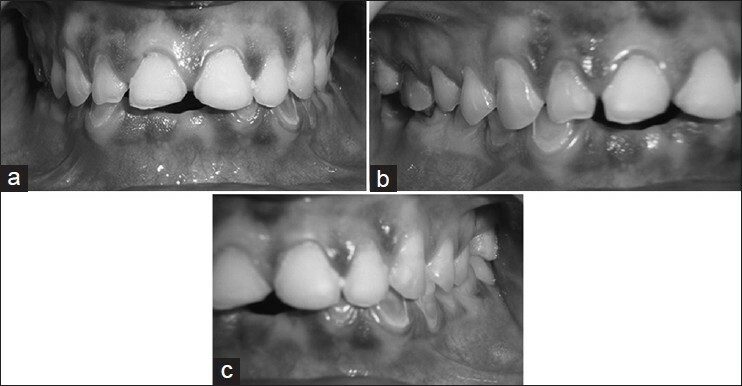 The gingival zenith of maxillary and mandibular anteriors were evened horizontally and leveled using gingivectomy and gingivoplasty  [Figure 4]a and b. The maxillary and mandibular anterior teeth preparations were redefined in harmony with the altered gingival margins 1 week after gingival recontouring. The final provisional restorations were fabricated from autopolymerizing acrylic resin (Alike™; GC America, Alsip, USA) using the direct-indirect technique. The provisional restorations were cemented with temporary cement (Freegenol Temporary Pack; GC Corp., Tokyo, Japan) and the patient's adaptation was monitored [Figure 5]a and b. Interim restorations were observed for 3 months and used as a guide for definitive oral rehabilitation. During this period, the patient's condition and functions, such as muscle tenderness, discomfort of TMJ, mastication, range of the mandibular movements, swallowing and speech, were evaluated. Improvement in mastication, speech and facial esthetics confirmed the patient's tolerance to the new mandibular position with the restored VDO. Bite registration was performed using occlusal registration material (StoneBite; Dreve Dentamid GmbH, Unna, Germany) by first removing the provisionals on the right side of the arch while maintaining the provisionals on the left side of the arch and vice-versa. Definitive impressions were made with polyvinylsiloxane impression material (Extrude; Kerr Corp., Romulus, Germany). After 1 week, metal trial was done [Figure 6]a and b and porcelain fused to metal restorations were fabricated using a customized anterior guide table, utilizing the duplicated provisional restoration casts and cemented with resin modified glass ionomer cement (FujiCEM; GC America, Alsip, USA)  [Figure 7]a-c and an orthopantomogram was obtained [Figure 8]. Because the patient's anterior guidance table was used in the production of definitie restoration, the amount of occlusal adjustment on the lingual surface of maxillary anterior teeth was minimal. The prostheses were designed using mutually protected occlusion. The anterior teeth protected the posterior teeth from excessive force and wear and the posterior teeth supported the bite force in CO. Oral hygiene instruction were given and regular reviews were scheduled. Three reviews were completed in a period of 6 months. Based on previous studies contact points were established in our case. An ideal esthetic treatment plan attempts to achieve perfection in every way. It is important to review a range of treatment options to achieve an esthetic smile while maintaining a healthy oral environment. Recognizing that form follows function and that anterior teeth play a vital role in the maintenance of oral health is paramount. In this clinical report, raising VDO using a removable occlusal splint followed by fixed provisionals based on accurate diagnosis ensured successful full mouth rehabilitation for a severely worn dentition. Management of worn dentition using fixed or removable prostheses is complex and among the most difficult to rehabilitate. Assessment of the vertical dimension is important and a comprehensive treatment plan is required for each individual case. Articulated study casts and a diagnostic wax-up can provide important information for the evaluation of treatment options. In this case, tolerance to changes in VDO was confirmed with clinical evaluation of the patient after having worn a diagnostic splint and provisional prosthesis. 1. Turner KA, Missirlian DM. Restoration of the extremely worn dentition. J Prosthet Dent 1984;52:467-74. 2. Prasad S, Kuracina J, Monaco EA Jr. 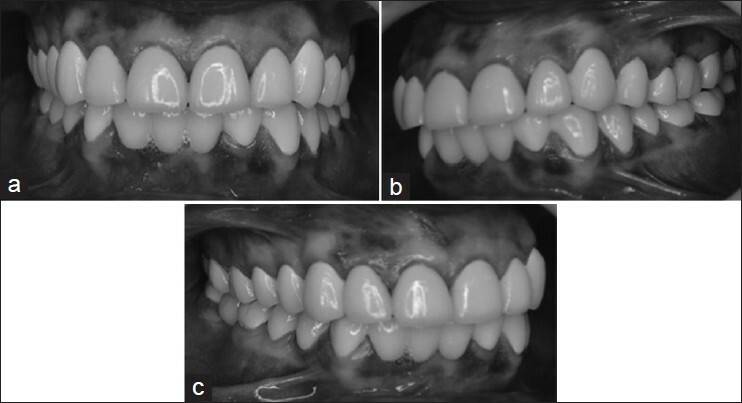 Altering occlusal vertical dimension provisionally with base metal onlays: A clinical report. J Prosthet Dent 2008;100:338-42. 3. Jahangiri L, Jang S. Onlay partial denture technique for assessment of adequate occlusal vertical dimension: A clinical report. J Prosthet Dent 2002;87:1-4. 4. Dawson PE. From TMJ to Smile Design. 1 st ed. New York: Elsevier Inc.; 2008. 5. Kar AK, Parkash H, Jain V. Full-mouth rehabilitation of a case of generalized enamel hypoplasia using a twin-stage procedure. Contemp Clin Dent 2010;1:98-102. 6. Banerjee S, Chakraborty N, Singh R, Gupta T. Full-mouth rehabilitation of a patient with severe attrition using the Hobo twin-stage procedure. Contemp Clin Dent 2012;3:103-7. 7. Dawson PE. Functional Occlusion: From TMJ to Smile Design. 1 st ed. New York: Elsevier Inc.; 2008. p. 430-52. 8. Ganddini MR, Al-Mardini M, Graser GN, Almog D. Maxillary and mandibular overlay removable partial dentures for the restoration of worn teeth. J Prosthet Dent 2004;91:210-4. 9. Hempton TJ, Dominici JT. 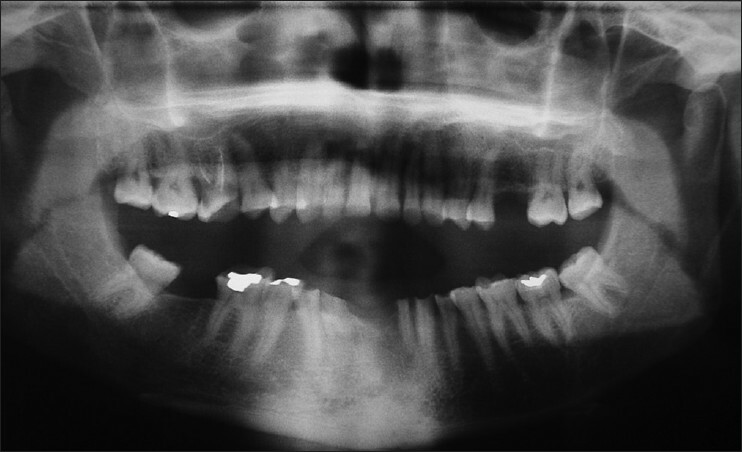 Contemporary crown-lengthening therapy: A review. J Am Dent Assoc 2010;141:647-55. 10. Hoyle DE. Fabrication of a customized anterior guide table. J Prosthet Dent 1982;48:490-1. 11. Brown KE. Reconstruction considerations for severe dental attrition. J Prosthet Dent 1980;44:384-8. 12. Sato S, Hotta TH, Pedrazzi V. Removable occlusal overlay splint in the management of tooth wear: A clinical report. J Prosthet Dent 2000;83:392-5. 13. Davis NC. Smile design. Dent Clin North Am 2007;51:299-318.